There are plenty of applications on the market geared towards elementary school students, but what about those who are in middle or high school? The Mobile Education Store realized that teenagers still needed to work on their sentence structure and answered our calls for more great apps by creating Sentence Builder Teen! With real-life images, this application will motivate your students and help them learn how to form grammatically correct sentences at the same time! Like the original Sentence Builder application, each sentence is matched with a picture to help the student determine the correct way to form the sentence. Sentence Builder Teen joins a legacy of award-winning Mobile Education Tools applications as the 2010 IEAR Language Arts App of the Year. 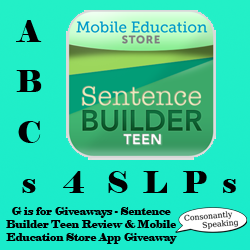 Continue reading to learn more about Mobile Education Store's Sentence Builder Teen and to enter a giveaway to win one of the Mobile Education Store applications! The charming male voice welcomes you back to Sentence Builder once again and the title image fades into the "Settings" tab of the application. Shown in portrait format, it shows a space to type a students’ name as well as various settings you can choose based on a students’ level of cognition, language skills, age, and grade. The tabs at bottom of the screen are similar to the other Mobile Education Apps. The "Info" tab (with an icon of a lower case “i” with a circle around it), when pressed, brings you to the developers’ information about the application as well as their interpretation of how the application should be used. Mobile Education Store states that Sentence Builder is designed to “help children learn how to build grammatically correct sentences”. The "Settings" tab (with an icon of a file cabinet), when pressed, shows you choices for various settings in the application. It allows you to type the students’ name, select the level of play, and choose whether or not you would like audio reinforcement following correct answers. The "Stats" tab (with an icon of a bar graph) shows statistics on how well a student is able to create grammatically correct sentences out of three trials. 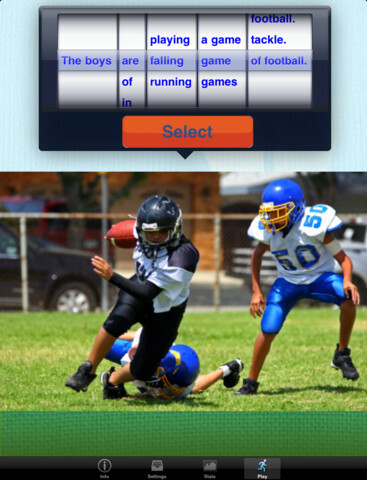 Finally, the "Play" tab (with an icon of a running man), opens the sentence building activity itself. More detail on each of these tabs will follow. When you click on the box underneath the label “Student Name”, the keyboard will appear at the bottom of the iPad. You can then type the students’ name into this box, and it will carry over to the "Stats" tab. Multiple names can be stored in the application, and you must select which student is the one who is currently playing in order for him or her to be scored. Once a name is chosen, the name will carry over to the "Stats" tab with the data remaining the same until you press the “Reset Stats” button. Level 1: The subject and adjective are fixed in the sentence, but the student will choose the appropriate modifier and verb, out of 2-3 phrases, to match the fixed sentence structure as well as the picture. Level 2: The student chooses the correct modifier, verb, and adjective (2, 3, or 5 choices) in the sentence to appropriately match the already fixed parts of the sentence as well as the picture. Level 3: The student must correctly choose the modifier, verb, and adjective in the sentence that match the already fixed parts of the sentence and the picture, but they will have 5 choices of words/phrases to help them use correct sentence structure. Another setting for you to choose is whether or not you want correct audio reinforcement for your student. There is a slide switch or button that is already set to “on”, but if you click it off, it will turn off audio reinforcements following each correct answer. If this setting is on and the sentence is built correctly, the narrator will state “that’s right, the correct answer is” and then state the correct sentence. Prior to each sentence, a male voice states “make a sentence about the picture”. If this is too repetitive for your students, you have the option to turn this statement off by pushing the on or off button next to the text. 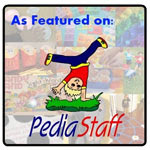 The two modules available include Teen Boy or Girl related themes. You must select which module you would like to use before beginning the application. Choose which application best suits your student by pressing the text. Once you press the module you would like, a check mark will appear next to it. Once you have decided which settings are the most appropriate for your student and select the Play tab, you are set to go! You will hear audio encouraging your student to “make a sentence about the picture”. This instruction will only be given if you have “audio instructions” on in the Settings tab. You will see a picture at the bottom right of the screen, a select button on the left hand side or middle of the screen, and multiple vertical word wheels at the top. To start creating your sentence, press and move the separated word wheels up and down. Each wheel contains a grammatical part of the sentence (noun, pronoun, verb, article, preposition/prepositional phrase, adjective, etc.). Whichever word is highlighted, in gray, in the middle upon release of the wheel, is the word that will be selected for the sentence. There will be some wheels that are static, or will not move and have a word pre-selected, and some wheels that you are able to move, with 2-5 choices of words on them. Move the word wheels to highlight each word or phrase (2-3 words) in the middle to make a sentence that is grammatically correct. Once you believe that you have created the grammatically correct sentence that matches the picture, press the “Select” button. There is only one grammatically correct sentence per picture. If you get the sentence lined up with the correct words there will be an option to move on to the next sentence. If you the correct answer audio reinforcement on, hear the male narrator’s voice state “that’s right, the correct answer is _____” with a repetition of your sentence. If you do not have correct answer animations or audio reinforcement on, you will not hear a repetition of the sentence. If the sentence is lined up incorrectly, whether you have audio reinforcement on or not, you will always hear an audio motivator for your student to keep trying. Check out the "Stats" tab once you have finished playing with the application. Once pressed, will show you a word chart of data based on the student’s performance. The student’s name will be shown at the top followed by the level in which the student played last. It will next show a total of how many sentences at each level were attempted. Underneath each level heading, it will state how many of the students’ sentences were accurately formed on the 1st, 2nd, and 3rd+ attempts. Once your student has completed his or her turn on the app, you can click the “Reset Stats” button to delete the quantitative information reported. After this is done, the application is ready for a new user selected on the Settings menu! The greatest part about the Sentence Builder Teen application is the fact that it uses real-life, age-appropriate images instead of cartoons. I also love that there are not any cartoon animations in this application because they are too young for my adolescent students. This application is great for my students to track their own progress and view the statistical chart of how well they performed each time they play. This way, they are motivated for a higher rate of success the next time they play the application. I would love to see this application on the iPhone/iPod touch for those who do not own an iPad. It is definitely a must-have application! Like in my review for the original Sentence Builder application, it would be nice to see an update that highlights or changes the color of the portion of the sentence that is incorrect. That way, my students can fix the part of their sentence that is incorrect! Sentence Expansion – The application itself already has sentences that are expanded slightly more than the simple subject + verb + object sentence. However, one can keep expanding sentences by encouraging students to add more detail about the picture. You can encourage students to add a preposition, adverb, or adjective to the sentence to expand it even further. Inference/Prediction – Ask your student what he or she thinks will happen next after the sentence/image shown. Emotions – Ask your student how the person in the picture is feeling. Place emphasis on facial and body cues (smile, frown, eyebrows, arms crossed, etc). Problem Solving/Social Situation – Some of the photos show the characters in the middle of a problematic situation/conflict. Ask your students what they would do if they were in the same situation. Describing – Have your students describe the picture. They can state adjectives including colors, shapes, and sizes as well as state emotions, location, category, function, and parts of the picture. Narrative – Have the student think of a time when he or she performed or saw someone/an animal perform the action in the picture. Did he or she enjoy it? What else happened? Articulation – Have the student read the sentence aloud prior to selecting the answer correctly producing their speech sound if it is in the sentence. 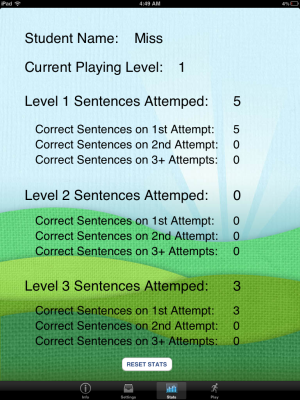 Sentence Builder Teen is available for the iPad for $5.99! 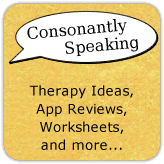 Consonantly Speaking was given a copy of four different Mobile Education Store applications to give away with this review. No other form of compensation was given.